1. Park, J.W., Lanier, T.C., Keeton, J.T., and Hamann, D.D. 1987. Use of cryoprotectants to stabilize functional properties of pre-rigor salted beef during frozen storage. J. Food Sci. 52:537-542. 2. Park, J.W., Lanier, T.C., Swaisgood, H.E., Hamann, D.D., and Keeton, J.T. 1987. Effects of cryoprotectants in minimizing physicochemical changes of bovine natural actomyosin during frozen storage. J. Food Biochem. 11:143-161. 3. Park, J.W. and Lanier, T.C. 1987. Combined effects of phosphates and sugar or polyol on protein stabilization of fish myofibrils. J. Food Sci. 52:1509-1513. 4. Park, J.W., Lanier, T.C., and Green, D.P. 1988. Cryoprotective effects of sugar, polyols, and/or phosphates on Alaska pollock surimi. J. Food Sci. 53:1-3. 5. Park, J.W. and Lanier, T.C. 1988. Calorimetric changes during development of rigor mortis. J. Food Sci. 53:1312-1314, 1372. 6. Park, J.W. and Lanier, T.C. 1989. Scanning calorimetric behavior of tilapia myosin and actin due to processing of muscle and protein purification. J. Food Sci. 54:49-51. 7. Park, J.W., Korhonen, R.W., and Lanier, T.C. 1990. Effects of rigor mortis on gel-forming properties of surimi and unwashed mince prepared from tilapia. J. Food Sci. 55(2):353-355, 366. 8. Park, J.W. and Lanier, T.C. 1990. Effects of salt and sucrose addition on the thermal denaturation and aggregation of water-leached fish muscle. J. Food Biochem. 14:395-404. 9. Park, J.W., Lanier, T.C., and Pilkington, D.H. 1993. Cryostabilization of functional properties of pre-rigor and post-rigor beef by dextrose polymer and/or phosphates. J. Food Sci. 58:467-472. 10. Park, J.W. 1994. Functional properties of protein additives in surimi gels. J. Food Sci. 59: 525-527. 11. Park, J.W., Yongsawatdigul, J., and Lin, T.M. 1994. Rheological behavior and potential cross-linking of Pacific whiting surimi. J. Food Sci. 59:773-776. 12. Howe, J.R., Hamann, D.D., Lanier, T.C., and Park, J.W. 1994. Fracture of Alaska pollock gels in water: Effects of minced muscle processing and test temperature. J. Food Sci. 59:777-780. 13. Park, J.W. 1994. Cryoprotection of muscle proteins by carbohydrates and polyalcohols - A review. J. Aquat. Food Prod. Technol. 3(3):23-41. 14. Lin, T.M., Park, J.W., and Morrissey, M.T. 1995. Recovered protein and recondition of water from surimi processing waste. J. Food Sci. 60:4-9. 15. Yongsawatdigul, J., Park, J.W., Kolbe, E., AbuDagga, Y., and Morrissey, M.T. 1995. Ohmic heating maximizes gel functionality of Pacific whiting surimi. J. Food Sci. 60:10-14. 16. Park, J.W. 1995. Surimi gel colors as affected by moisture content and physical conditions. J. Food Sci. 60:15-18. 17. Park, J. W. 1995. Effects of salt, surimi and/or starch content on fracture properties of gels at various test temperatures. J. Aquat. Food Prod. Technol. 4(2):75-84. 18. Yongasawatdigul, J., Park, J.W., and Kolbe, E. 1995. Electrical conductivity of Pacific whiting surimi during ohmic heating. J. Food Sci. 60:922-925, 935. 19. Pipatsattayanuwong, S., Park, J.W., and Morrissey, M.T. 1995. Functional properties and shelf life of fresh surimi from Pacific whiting. J. Food Sci. 60:1241-1244. 20. Yongsawatdigul, J. and Park, J.W. 1996. Linear heating rate affects gel formation of Alaska pollock and Pacific whiting. J. Food Sci. 61:149-153. 21. Lin, T.M. and Park, J.W. 1996a. Extraction of proteins from Pacific whiting mince at various washing conditions. J. Food Sci. 61:432-438. 22. Park, J.W. 1996. Temperature-tolerant fish protein gels using konjac flour. J. Muscle Food 7:165-174. 23. Lin, T.M. and Park, J.W. 1996b. Protein solubility in Pacific whiting affected by proteolysis during storage. J. Food Sci. 61:536-539. 24. Kim, J.M., Liu, C.H., Eun, J.B., Park, J.W., Oshimi, R., Hayashi, K., Ott, B., Aramaki, T., Sekine, M., Horikita, Y., Fujimoto, K., Aikawa, T., Welch, L., and Long, R. 1996. Surimi from fillet frames of channel catfish. J. Food Sci. 61:428-431. 25. Lin, T.M. and Park, J.W. 1997. Effective washing conditions reduce water usage for surimi processing. J. Aquat. Food Prod. Tech. 6(2):65-79. 26. Yongsawatdigul, J., Park, J.W., and Kolbe, E. 1997a. Texture degradation kinetics of gels made from Pacific whiting surimi. J. Food Process Eng. 20:433-452. 27. Yongsawatdigul, J., Park, J.W., and Kolbe, E. 1997b. Degradation kinetics of myosin heavy chain of Pacific whiting surimi. J. Food Sci. 62:724-728. 28. Yoon, W.B., Park, J.W., and Kim, B.Y. 1997a. Linear programming in blending various components in surimi seafood. J. Food Sci. 62:561-564, 567. 29. Yoon, W.B., Park, J.W., and Kim, B.Y. 1997b. Surimi-starch interactions based on mixture design and regression models. J. Food Sci. 62:555-560. 30. Park, J.W., Lin, T.M, and Yongsawatdigul, J. 1997. New developments in manufacturing of surimi and surimi seafood. Food Rev. Int'l. 13(4):577-610. 31. Yang, H. and Park, J.W. 1998. Effects of starch properties and thermal-processing conditions on surimi-starch gels. LWT- Food Science and Technology 31(4):344-353. 32. Lin, T.M. and Park, J.W. 1998. Solubility of salmon myosin as affected by conformational changes at various ionic strengths and pH. J. Food Sci. 62:215-218. 33. Lee, N.G. and Park, J.W. 1998. Calcium compounds to improve gel functionality of Pacific whiting and Alaska pollock surimi. J. Food Sci. 63:969-974. 34. Wu, H., Kolbe, E., Flugstad, B., Park, J.W., and Yongsawatdigul, J. 1998. Electrical properties of fish mince during multi-frequency ohmic heating. J. Food Sci. 63:1028-1032. 35. Yoon, W.B., Park, J.W., Kim, B.Y., and Kim, M.H. 1998. Dynamic properties of surimi-based seafood product as a function of moisture content. Food Eng. Progress 2(1):23-29. 36. Su, A., Kolbe E., and Park, J.W. 1999. A model of heat transfer coefficient of steam-cooked surimi paste. J. Aquat. Food Prod. Technol. 8(3):39-53. 37. Shie, J.S. and Park, J.W. 1999. Physical characteristics of surimi seafood as affected by thermal processing conditions. J. Food Sci. 64:287-290. 38. Yoon, W.B., Kim, B.Y., and Park, J.W. 1999. Rheological characteristics of fibrinogen-thrombin solution and its behavior in surimi gels. J. Food Sci. 64:291-294. 39. Yongsawatdigul, J. and Park, J.W. 1999. Thermal aggregation and dynamic rheological properties of Pacific whiting and cod myosin as affected by heating rate. J. Food Sci. 64:679-683. 40. Choi, Y.J., Kim, I-S., Cho, Y-J, Seo, D-H, Lee, T-G, Park, Y-B, and Park, J.W. 1999. Peptide properties of rapid salted and fermented anchovy sauce using various proteases. 2. Characterization of hydrolytic peptides from anchovy sauce and actomyosin. J. Korean Fish. Soc. 32(4):488-494. 41. Kim, I-S., Choi, Y-J., Heu, M-S., Cho, Y-J., Im, Y-S., Gu, Y-S., Yeo, S-G., and Park, J. W. 1999. Peptide properties of rapid salted and fermented anchovy sauce using various proteases. 1. Hydrolysis of anchovy sauce and actomyosin by various proteases. J. Korean Fish. Soc. 32(4):481-487. 42. Klesk, K., Yongsawatdigul, J., Park, J.W., Viratchakul, S., and Virulhakul, P. 2000. Gel forming ability of tropical tilapia surimi as compared with Alaska pollock and Pacific whiting surimi. J. Aquat Food Prod. Technol. 9(3):91-104. 43. Yongsawatdigul, J., Park, J.W., Virulhakul, P., and Viratchakul, S. 2000. Proteolytic degradation of tropical tilapia surimi. J. Food Sci. 65(1):129-133. 44. Zhao, Y., Flugstad, B., Kolbe, E., Wells, J.H., and Park, J.W. 2000. Using capacitive (Radio Frequency) dielectric heating in food processing and preservation – a review. J. Food Process Eng. 23:25-55. 45. Choi, Y.J., Cho, M.S., and Park, J.W. 2000. Effect of hydration time and salt addition on gelation properties of major protein additives. J. Food Sci. 65(8):1338-1342. 46. Lopetcharat, K., Choi, Y.J., Park, J.W., and Daeschel, M.D. 2001. Fish sauce products and manufacturing - a review. Food Rev. Int’l 17(1):65-88. 47. Yoon, W.B. and Park, J.W. 2001. Development of linear heating rates using conventional baths and computer simulation. J. Food Sci. 66(1):132-136. 48. Hoffman, J. and Park, J.W. 2001. Improved torsion testing using molded surimi gels. J. Aquat. Food Prod. Technol. 10(2):75-84. 49. Wendel, A., Park, J.W., and Kristbergsson. 2002. Recovered meat from Pacific whiting frames. J. Aquat. Food Prod. Technol. 11(1):5-18. 50. Lopetcharat, K. and Park, J.W. 2002. Characterization of fish sauce made from Pacific whiting and surimi by-products during fermentation stage. J. Food Sci. 67(2):511-516. 51. Reynolds, J., Park, J.W., and Choi, Y.J. 2002. Physicochemical properties of Pacific whiting surimi as affected by various freezing and storage conditions. J. Food Sci. 67(6):2072-2078. 52. Choi, Y.J. and Park, J.W. 2002. Acid-aided protein recovery from enzyme-rich Pacific whiting. J. Food Sci. 67(8):2962-2967. 53. Yongsawatdigul, J. and Park, J.W. 2002. Biochemical and conformational changes of actomyosin from threadfin bream stored in ice. J. Food Sci. 67(3): 985-990. 54. Yongsawatdigul, J., Worrato, A., and Park, J.W. 2002. Effect of endogenous transglutaminase on threadfin bream surimi gelation. J. Food Sci. 67(9): 3258-3263. 55. Jaczynski, J. and Park, J.W. 2002. Temperature prediction during thermal processing of surimi seafood. J. Food Sci. 67(8):3053-3057. 56. Choi, Y.J., J.D. Park, J-S. Kim, Y-J. Cho and J.W. Park. 2002. Rheological properties of heat-induced gels of surimi from acid and alkali process. J Korean Fish Soc, 35(4), 309-314. 57. Tungkawachra, S., Park, J.W., and Choi, Y.J. 2003. Biochemical properties and consumer acceptance of Pacific whiting fish sauce. J. Food Sci. 68(3):855-860. 58. Jaczynski, J. and Park, J.W. 2003. Predictive models for microbial inactivation and texture degradation in surimi seafood during thermal processing. J. Food Sci. 68(3):1025-1030. 59. Kim, Y.S., Park, J.W., and Choi, Y.J. 2003. New approaches for the effective recovery of fish proteins and their physicochemical characteristics. J. Fisheries Sci. 69:1231-1239. 60. Yongsawatdigul, J. and Park, J.W. 2003. Thermal denaturation and aggregation of threadfin bream actomyosin. Food Chemistry 83(3):409-416. 61. Jaczynski, J. and Park, J.W. 2003. Microbial inactivation and electron penetration in surimi seafood during electron beam processing. J. Food Sci. 68(5):1788-1792. 62. Jaczynski, J and Park, J.W. 2003. Physicochemical properties of surimi seafood as affected by electron beam and heat. J. Food Sci. 68(5): 1626-1630. 63. Han, G.H., Kim, B.Y., Hahm, Y.T., and Park, J.W. 2003. Development of optimized feed formulation using agricultural and marine by-products. Food Sci. Biotechnol. 12(1):55-61. 64. Thawornchinsombut, S. and Park, J.W. 2004. Roles of pH in solubility and conformational changes of Pacific whiting muscle proteins. J. Food Biochem. 28:135-154. 65. Jaczynski, J. and Park, J.W. 2004. Physicochemical changes of Alaska pollock surimi and surimi gels as affected by electron beam. J. Food Sci 69(1):FCT53-57. 66. Choi, M.R., Yoo, E.J., Lim, H.S., and Park, J.W. 2003. Biochemical and physiological properties of fermented skate. Korean J. Life Sci. 13(5):675-683. 67. Yongsawatdigul, J., and Park, J.W. 2004. Effects of alkali and acid solubilization on gelation characteristics of rockfish muscle proteins. J. Food Sci. 69 (7):C499-505. 68. Yoon, W.B., Gunasakaran, S., and Park, J.W. 2004. Evaluating viscosity of surimi paste at different moisture contents. Applied Rheology 14(3):133-139. 69. Esturk, O., Park, J.W., and Thawornchinsombut, S. 2004. Thermal sensitivity of fish proteins from various species on rheological properties of gels. J. Food Sci. 69(7):E412-6. 70. Kim, J.S. and Park, J.W. 2004. Characterization of acid-soluble collagen from Pacific whiting surimi processing by-products. J. Food Sci. 69(8):C367-42. 71. Yoon, W.B., Gunasakaran,S., and Park, J.W. 2004. Characterization of thermorheological behavior of Alaska pollock and Pacific whiting surimi. J. Food Sci. 69(7):E1-5. 72. J Park. 2004. Surimi gel preparation and texture analysis for better quality control. Dev Food Sci 42:333-341. 73. J Yongsawatdigul, JW Park. 2004. Gelation of threadfin bream surimi as affected by thermal denaturation, transglutaminase, and proteinase(s) activities. Dev Food Sci 42:343-356. 74. Thawornchinsombut, S. and Park, J.W. 2005. Roles of NaCl in solubility and conformational changes of Pacific whiting muscle proteins. J. Food Biochem. 29:132-151. 75. Kim, Y.S., Yongsawatdigul, J., Park, J.W., and Thawornchinsombut, S. 2005. Characteristics of sarcoplasmic proteins and their interaction with myofibrillar proteins. J. Food Biochem. 29: 517-532. 76. Kim, J.S. and Park, J.W. 2005. Partially purified collagen from refiner discharge of Pacific whiting surimi processing. J. Food Sci. 70(8) C511-C516. 77. Thawornchinsombut, S., Park, J.W., Meng, G., and Li-Chan, E.C.Y. 2006. Raman spectroscopy determines structural changes associated with gelation properties of fish proteins recovered at alkaline pH. J. Agr. Food Chem. 54:2178-2187. 78. Thawornchinsombut, S. and Park, J.W. 2006. Frozen stability of fish protein isolate at various storage conditions. J. Food Sci. 71(3): C227-C232. 80. Kok, N. and Park, J.W. 2006. Elucidating factors affecting the flotation of fish ball. J. Food Sci. 71(6):E297-E302. 81. Kok, N. and Park, J.W. 2007. Extending the shelf life of set fish ball. J Food Quality 30:1-27. 82. Hjalmarsson, G.H., Park, J.W., and Kristbergsson, K. 2007. Seasonal effects on physicochemical characteristics of fish sauce made from capelin (Mallotus villosus). Food Chemistry 103(2007) 495-504. 83. Park, J.D. and Park, J.W. 2007. Extraction of sardine myoglobin and its effect on gelation properties of Pacific whiting surimi. J. Food Science 72(4):C202-C207. 84. Thawornchinsombut, S. and Park, J.W. 2007. Effect of NaCl on gelation characteristics of acid- and alkaline-treated Pacific whiting fish protein isolates. J. Food Biochem. 31:427-455. 85. Kok, N., Park, J.D., Lin, T.M., and Park, J.W. 2007. Multidisciplinary approaches for early determination of gelation properties of fish proteins. J. Aquat. Food Products Technol. 16(1):5-18. 86. Pongviratchai, P. and Park, J.W. 2007. Physical properties of fish proteins cooked with starches or protein additives under ohmic heating. J. Food Quality 30:783-796. 87. Pongviratchai, P. and Park, J.W. 2007. Electrical conductivity and physical properties of surimi-potato starch paste under ohmic heating. J Food Sci 72(9):E503-E507. 88. Choi, Y.J., Lin, T.M., Tomlinson, K., and Park, J.W. 2007. Effect of salt concentration and temperature of storage water on the physicochemical properties of fish proteins. LWT 41(2008):460-468. 89. Park CH, Lee JH, Kang KT, Park JW, Kim JS. 2007. Characterization of acid-soluble collagen from Alaska Pollock surimi processing by-products (refiner discharge). Food Sci. Biotechnol. 16(4): 549-556. 90. Park JD, Yongsawatdigul J, Choi, YJ, Park JW. 2008. Biochemical and conformational changes of myosin purified from Pacific sardine at various pH. J Food Sci 73(3):C191-197. 91. Reed ZH, Park JW. 2008. Qualification and Quantification of Fish protein in prepared surimi crabstick. J Food Sci. J Food Sci 73(5):C329-334. 92. Kang EJ, Hunt AL, Park JW. 2008. Effects of salinity on physicochemical properties of Alaska pollock surimi after repeated freeze-thaw cycles. J Food Sci. 73(5):C347-355. 93. Kim, B.Y. and Park, J.W. 2008. Capillary extrusion viscometer for viscosity measurement of fish protein paste. J Food Quality. 31:536-548. 94. Kim, YS, Park, JW. 2008. Negative roles of salt in gelation properties of fish protein isolate. Food Sci. 73(8):C585-588. 95. Choi YJ, Hur S, Choi BD, Konno K, and Park JW. 2009. Enzymatic hydrolysis of recovered protein from frozen small croaker and functional properties of its hydrolysates. J Food Sci 74 (1): C17-C24. 96. Kim JS, Schnee R, Park JW. 2009. Chemical and functional properties of various blends of phosphates. Food Quality 32:504-521. 97. Hunt A, Getty KJK, Park JW. 2009. Roles of starch in surimi seafood: A review. Food Reviews International 25(4):299-312. 98. Reed ZH, Park JW. 2009. Estimating the quantity of egg white and whey protein concentrate in prepared crabstick using ELISA. Food Chemistry 118(2010) 575-581. 99. Hunt A, Handa A, Park JW. 2009. Effect of various types of egg white on characteristics and gelation of fish myofibrillar proteins. J Food Sci 74(9): C666-C673. 100. Poowakanjana J, Park JW. 2009. Controlling the bleeding of carmine colorant in crabstick. J Food Sci 74(9):C707-712. 101. Tadpitchayangkoon P, Park JW, Yongsawatdigul J. 2010. Conformational changes and dynamic rheological properties of fish sarcoplasmic proteins treated at various pHs. Food Chemistry 121:1046-1052. 102. Park CH, Kim HJ, Kang KT, Park JW, Kim JS. 2009. Fractionation and agiotensin I-conversion enzyme (ACE) inhibitory activity of gelatin hydrolysates from by-products of Alaska pollock surimi. Fish Aqua Sci 12(2):79-85. 103. Park CH, Kim HJ, Kang KT, Park JD, Heu MS, Park JW, Kim JS. 2009. Fractionation of gelatin hydrolysates with antioxidative activity from Alaska Pollock surimi refiner discharge. Fish Aqua Sci 12(3):163-170. 104. Heu, MS, Park CH, Kim HJ, Park JW, Kim JS. 2009. Partial purification of antioxidative peptides from gelatin hydrolysates of Alaska pollock surimi refiner discharge. Fish Aqua Sci 12(4):249-257. 105. Reed ZH, Park JW. 2010. Quantification of Alaska pollock surimi in prepared crabstick by competitive ELISA using a myosin light chain 1 specific peptide. Food Chemistry 123:196-201. 106. Hunt A, Getty KJ, Park JW. 2010. Screening of special starches for use in temperature tolerant fish protein gels. J Food Quality 33 (777):100-118. 107. Hunt A, Getty KJ, Park JW. 2010. Development of temperature tolerant surimi gels using starch-protein interactions. J Food Quality 33 (777):119-137. 108. Reed ZH, Park JW. 2011. Rheological and biochemical characterization of salmon myosin using a constant heating rate. J Food Sci C343-349. 109. Tadpitchayangkoon P, Park JW, Mayer SG, Yongsawatdigul J. 2010. Structural changes and dynamic rheological properties of sarcoplasmic proteins subjected to pH-shift method. J Agric Food Chem. 58:4241-4249. 110. Reed ZH, Guilford W, Park JW. 2011. Thermal denaturation of tilapia myosin and its subunits as affected by constantly increasing temperature. J Food Sci 76: C1018-1024. 111. Reed ZH, Park JW. 2011. Thermophysical characterization of tilapia myosin and its subfragments. J Food Sci. 76:C1050-1055. 113. Yoon WB, Park JW. 2011. Analysis of stress-strain behavior of Alaska pollock paste at constant moisture content. J Texture Studies 42: 430–434. 114. Tadpitchayangkoon P, Park JW, Yongsawatdigul J. 2012. Gelation characteristics of tropical surimi under water bath and ohmic heating. LWT-Food Science and Technology 46:97-103. 115. Poowakanjana S, Mayer S, Park JW. 2012. Optimum chopping condition of Alaska pollock, Pacific whiting, and threadfin bream surimi paste and gel based on rheological and Raman spectroscopic analysis. J Food Sci 77(4):E88-E97. 116. Nguyen HM, Hwang IC, Park JW, Park HJ.2012. Photoprotection for deltamethrin using chitosan-coated beeswax solid lipid nanoparticles. Pest Manag Sci 68(7):1062–1068. 117. Nguyen HM, Hwang IC, Park JW, Park HJ.2012. Enhanced payload and photo-protection for pesticides using nanostructured lipid carriers with corn oil as liquid lipid. J Microencapsulation 29(6):596-604. 119. Poowakanjana S, Park JW. 2013. Biochemical characterization of Alaska pollock, pacific whiting, and threadfin bream surimi as affected by comminution conditions. Food Chemistry 138:200-207. 120. Hunt A, Park JW. 2013. Interaction of fish proteins and refined carrageenan as affected by various salts. J Food Quality 36 (2013) 51–58. 121. Park JD, Park JW, Yoon WB. 2013. Semi-empirical Relationship between Rupture Properties of Surimi Pastes and Failure Shear Stress of Surimi Gels at Different Moisture Contents. J Texture Studies 44 (3): 247–252. 122. Kim H, Kim BY, Gunasekaran S, Park JW, WB Yoon. 2013. Comparison of Concentration Dependence of Mechanical Modulus in Two Biopolymer Gel Systems using Scaling Analysis. Food Sci. Biotechnol. 22(6): 1601-1606. 123. Yin T, Park JW. 2014. Effects of Nano-scaled fish bone on the gelation properties of Alaska pollock surimi. Food Chemistry 150 (2014) 463–468. 124. Esturk O, Park JW. 2014. Comparative study on degradation, aggregation and rheological properties of actomyosin from cold, temperate and warm water fish species. Turkish Journal of Fisheries and Aquatic Sciences 14: 67-75 (2014). 125. Yin T, Reed ZH, Park JW. 2014. Gelling properties of surimi as affected by the particle size of fish bone. LWT-Food Sci & Tech 58(2):412–416. 126. Poowakanjana S, Park JD, Park JW. 2014. Elucidating the comminution steps to enhance the value of surimi from tropical fish. J Aquat Food Product Technol. Published online: 14 May 2014.Available at http://www.tandfonline.com/doi/full/10.1080/10498850.2013.808302#.VLwlnkfF8rU. 127. Hunt A, Park JW. 2014. Effects of sodium bicarbonate on gelling properties of Alaska pollock surimi prepared at different freezing rates. J Food Quality 37:349–360. 128. Fowler MR, Park JW. 2015. Salmon blood plasma: effective inhibitor of protease-laden Pacific whiting surimi and salmon mince. Food Chemistry 176:448-454. 129. Fowler MR, Park JW. 2015. Effect of salmon plasma protein on Pacific whiting surimi gelation under various ohmic heating conditions. LWT-Food Sci and Tech. 61 (2): 309-315. 130. Yin T, Park JW. 2015. Textural and rheological properties of Pacific whiting surimi as affected by nano-scaled fish bone and heating rates. Food Chemistry 180 (2015) 42–47. 131. Yin T, Park JW. 2015. Optimum processing conditions for slowly heated surimi seafood using protease-laden Pacific whiting surimi. LWT-Food Sci and Tech. 63:490-496. 132. Poowakanjana S, Park JW, Moon JH, Yoon WB. 2015. Assessing the dynamic rheology of surimi paste as affected by heating rates frequencies, and moisture contents. J. Texture Studies 46:302-311. 133. Kokkaew H, Thawornchinsombut S, Pitirith T, Park JW. 2015. Optimal conditions to remove chemical hazards in fish protein isolates from tilapia frame using response surface methodology. J Aquat Food Product Tech. 24(7): 672-685. 134. Yin T, Park JW, Xiong SB. 2015. Physical properties of nano fish bone prepared by wet media milling. LWT-Food Sci & Tech 64:367-373. 135. Lee JH, Park JW. 2016. Pacific whiting frozen fillets as affected by postharvest processing and storage conditions. Food Chemistry 201-177-184. 136. Athaillah, Z, Park JW. 2016. Characterization of surimi slurries and their films derived from myofibrillar proteins with different extraction methods. Food Bioscience 15:118-125. 138. Kokkaew H, Thawornchinsombut S, Park JW. 2016. Optimal condition to remove mercury in yellowfin tuna protein isolates and ACE-inhibitory property of peptide prepared using commercial proteases. Songklanakarin J. Sci. Technol. 38 (4), 439-447. 140. Kobayashi Y, Mayer SG, Park JW. 2017. FT-IR and Raman spectroscopies determine structural changes of tilapia fish protein isolate and surimi under different comminution conditions. Food Chemistry 226 (2017) 156–164. 142. Lee MG, Yoon WB, and Park JW. 2017. Combined effect of pH and heating conditions on the physical properties of Alaska pollock surimi gels. J Texture Stud. 48:215–220. 143. Yin T, Park JW, Xiong SB. 2017. Effects of micron fish bone with different particle size on the properties of silver carp (Hypophthalmichthys molitrix) surimi gel. J of Food Quality. Volume 2017 (2017), Article ID 8078062, 8 pages. Published 28 Feb 2017. https://doi.org/10.1155/2017/8078062. 144. Lee J, Park HW, Jenkins R, and Park JW. 2017. Image and chemical analyses for freezing-induced aggregates of fish natural actomyosin as affected by various phosphate compounds. Food Bioscience 19:57-64. http://dx.doi.org/10.1016/j.fbio.2017.06.007. 145. Moon JH, Yoon WB, Park JW. 2017. Assessing the textural properties of Pacific whiting and Alaska pollock surimi gels prepared with carrot under various heating rates. Food Bioscience 20:12-18. http://dx.doi.org/10.1016/j.fbio.2017.07.008. 146. Kobayashi Y and Park JW. 2017. Physicochemical characterizations of tilapia fish protein isolate under two distinctively different comminution conditions. J Food Processing and Preservation. Published 22 May 2017. https://doi.org/10.1111/jfpp.13346. 147. Lee J, Park JW. 2016. Roles of TMAOase in muscle and drips of Alaska pollock fillets at various freeze/thaw cycles. J Food Processing and Preservation. Published 7 Aug 2017. https://doi.org/10.1111/jfpp.13427. 148. Kobayashi Y, Park JW. 2016. Optimal blending of two refined fish proteins prepared using different methods. Submitted to J of Food Processing and Preservation. Published: May 22, 2017. https://doi.org/10.1111/jfpp.13346. 149. Lee J, Peng Y, Heidolph B, and Park JW. 2016. Physicochemical Properties of Frozen Alaska Pollock Fillets and Surimi as Affected by Various Sodium Phosphates. J of Food Processing and Preservation 42:e13530.Published Nov 2, 2017. https://doi.org/10.1111/jfpp.13530. 150. Supawang S, Park JW, Thaowronchinsombut S. 2018. Fat blocking roles of fish proteins in fried fish cake. LWT- Food Science and Technology. 97 (2018) 462-468. 151. Supawang S, Park JW, Thaowronchinsombut S. 2018. Controlling Lipid Oxidation and Volatile Compounds in Frozen Fried Fish Cake Prepared with Rice Bran Hydrolysate. J Aquatic Food Product Technology. 27(8):885-899. 152. Supawang S, Park JW, Thaowronchinsombut S. 2019. Effect of Rice Bran Hydrolysates on Physicochemical and Antioxidative Characteristics of Fried Fish Cake during Repeated Freeze-Thaw Cycles. Food Bioscience. Accepted. Kolbe, E., Park, J.W., Wells, J.H., Flugstad, B.A., and Zhao, Y. 2001. Capacitive Dielectric Heating System. U.S. Patent 6,303,166. Issued October 16, 2001. Flugstad, B.A., Ling, Q, Kolbe, E.R, Wells, J.H., Zhao, Y., and Park, J.W. 2003. Variable Frequency Automated Capacitive Radio Frequency (RF) Dielectric Heating System. U.S. Patent 6,657,173. Issued December 2, 2003. 1. Park, J.W. 2000. Surimi and Surimi Seafood. 500 p. Marcel Dekker, New York, NY. 2. Park, J.W. 2005. Surimi and Surimi Seafood. Second edition, revised/expanded, 960p. CRC Press, Boca Raton, FL. 3. Park JW. 2014. Surimi and Surimi Seafood. Third edition. 666p. CRC Press, Boca Raton, FL. 1. Park, J.W. 1992. Use of various grades of surimi with an application of least cost formulation. In Pacific Whiting: Harvesting, Processing, Marketing, and Quality Assurance. (Ed.) Sylvia, G. and Morrissey, M.T. Oregon Sea Grant, Corvallis, OR. 2. Park, J.W. and Morrissey, M.T. 1994. The need for developing uniform surimi standards. In Quality Control and Assurance for Seafood. (Ed.) Sylvia, G., Shriver, A. and Morrissey, M.T. Oregon Sea Grant. Corvallis, OR. 3. Park, J.W. 1995. Water-soluble myofibrillar proteins in surimi processing. Proceedings of 1995 Spring Joint Meeting of Korean Societies on Fisheries Science, Pp. 63-76. 4. Park, J.W., Yang, H., and Patil, S. 1997. Development of temperature-tolerant fish protein gels using special starches. In Chemistry of Novel Foods. (Ed.). Spanier, A. M. Allured Pub. Co., Carol Stream, IL. Pp. 325-340. 5. Park, J.W., Yongsawatdigul, J. and Kolbe, E. 1998. Proteolyis and gelation of fish proteins under ohmic heating. In Process-Induced Chemical Changes in Foods, (Ed.) Shahidi, F., Ho, C-T., and Nguyen, V.C. Plenum Press, New York, NY. Pp.25-34. 6. Park, J.W. and Yongsawatdigul, J. 1999. Gelation properties of fish proteins under ohmic heating. In Quality Attributes of Muscle Foods, (Ed.) Xiong, Y., Shahidi, F., and Ho., C-T. Plenum Press, New York, NY. Pp421-429. 7. Kim, B.Y. and Park, J.W. 2000. Rheology and texture of surimi-based gels. In Surimi and Surimi Seafood, (Ed.) Park, J.W. Pp. 267-324. Marcel Dekker, New York, NY. 8. Morrissey, M.T., Park, J.W., and Huang, L. 2000. Surimi processing waste, its utilization, and management. In Surimi and Surimi Seafood, (Ed.) Park, J.W. Pp.127-165. Marcel Dekker, New York, NY. 9. Park, J.W. 2000. Ingredients technology and formulation development. In Surimi and Surimi Seafood, (Ed.) Park, J.W. Pp. 343-391. Marcel Dekker, New York, NY. 10. Park, J.W. 2000. Surimi Seafood: market, products, and manufacturing. In Surimi and Surimi Seafood, (Ed.) Park, J.W. Pp. 201-235. Marcel Dekker, New York, NY. 11. Park, J.W. and Morrissey, M.T. 2000. Manufacturing of surimi from light muscle fish. In Surimi and Surimi Seafood, (Ed.) Park, J.W. Pp. 23-58. Marcel Dekker, New York, NY. 12. Park, J.W. and Lanier, T.C. 2000. Processing of surimi and surimi seafoods. In Marine and Freshwater Products Handbook, (Eds.) Martin, R. E., Carter, E.P., Flicks, Jr., G. J., and L.M. Davis. Pp. 417-443. Techno Publishing Co, Lancaster, PA.
13. Jaczynski, J. and Park, J.W. 2004. Temperature, color, and texture prediction models for surimi seafood pasteurization. In Quality of Fresh and Processed Food. (Ed.) Shahidi, F. and Spanier, A., Ho, C-T., and Braggins, T. Pp. 121-134. Kluwer Academics/Plenum Press, New York, NY. 14. Park, J.W. 2004. Surimi gel preparation and texture analysis for better quality control. In More Efficient Utilization of Fish and Fisheries Products. Pp. 333-341. (Ed.) Sakaguchi, M. Elsevier, Amsterdam, Netherlands. 15. Yongsawatdigul, J. and Park, JW. 2004. Gelation of threadfin bream surimi as affected by thermal denaturation, transglutaminase and proteinase(s) activities. In More Efficient Utilization of Fish and Fisheries Products. (Ed.) Sakaguchi, M. Pp. 343-356. Elsevier, Amsterdam, Netherlands. 16. Tungkawachara, S. and Park, J.W. 2003. Development of Pacific whiting fish sauce: market potential and manufacturing in the United States. Proceeding of the 2nd International Seafood By-product Conference. Pp 321-331. University of Alaska, Fairbanks, AK. 17. Jaczynski, J. and Park, J.W. 2004. Application of electron beam to surimi seafood. In Irradiation of Food and Packaging: Recent Developments. (Ed.) Komolprasert, V. and Morehouse, K. Pp 165-179. American Chemistry Society, Washington, DC. 18. Park, J.W. and Lin, T.M. 2005. Surimi: Manufacturing and evaluation. In Surimi and Surimi Seafood, Second edition, revised/expanded. (Ed.) Park, J.W. Pp33-106. CRC Press, Boca Raton, FL. 19. Kim, B.Y., Park, J.W., and Yoon, W.B. 2005. 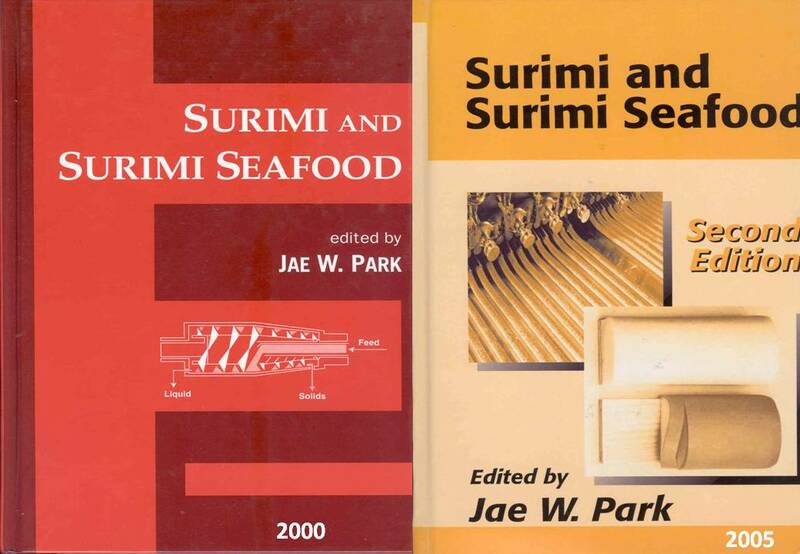 In Surimi and Surimi Seafood, Second edition, revised/expanded. (Ed.) Park, J.W. Pp491-582. CRC Press, Boca Raton, FL. 20. Park, J.W. 2005. Ingredient technology for surimi and surimi seafood. In Surimi and Surimi Seafood, Second edition, revised/expanded. (Ed.) Park, J.W. Pp649-708. CRC Press, Boca Raton, FL. 21. Park, J.W. 2005. Surimi seafood: Manufacturing, Market, and Products. In Surimi and Surimi Seafood, Second edition, revised/expanded. (Ed.) Park, J.W. Pp375-434. CRC Press, Boca Raton, FL. 22. Hultin, H.O., Kristinsson, H.G., Lanier, T.C., Park, J.W. 2005. Process for Recovery of Functional Proteins by pH Shifts. In Surimi and Surimi Seafood, Second edition, revised/expanded. (Ed.) Park, J.W. Pp107-140. CRC Press, Boca Raton, FL. 24. Park, J.W. 2005. Surimi gel preparation and texture analysis for better quality control (Japanese). In More Efficient Utilization of Fish and Fisheries Products. (Ed.) Sakaguchi, M. and Hirata, T. Pp359-364. N.T.S. Co Ltd, Tokyo, Japan. 25. Kim, J.S. and Park, J.W. 2006. Mince from seafood by-products and surimi as ingredients. In Maximizing the Value of Marine By-Products. (Ed) Shahidi, F. CRC Woodhead Press, Cambridge, England. p196-228. 26. Park, J.W. 2008. Coloring technology for surimi seafood. In Color Quality of Fresh and Processed Foods. ACS Symposium Series 983. (Ed.) Culver, C. and Wrolstad, R. American Chemistry Society, Washington, DC. P.254-266. 27. Park JW. 2009. Research update: Functional fish protein isolate, Proceedings of the 5th World Fisheries Congress, Yokohama, Japan (Oct 20-24, 2008). 29. Jaczynski J, Tahergorabi R, Hunt A, and Park JW. 2011. Safety and quality of frozen aquatic food products. In Handbook of Frozen Food Processing and Packaging, (2nd Ed) Sun, D.W. Boca Raton: CRC Press. p 343-385. 30. Park JW. 2012. Surimi and fish protein isolate. In: The Seafood Industry. (Ed) G Flakes, R Martin, L Granata. Wiley-Blackwell, West Sussex, UK. Pp118-127. 31. Park JW, Reed ZH. 2014. Effect of ohmic heating on biopolymers. In: Ohmic Heating in Food Processing. (Ed) HS Ramaswamy, M Marcotte, S Sastry, and K Abdelrahim. Chapter 8. CRC Press: Boca Raton, FL. p105-117. 32. Park JW, Nozaki H, Suzuki T, Beliveau JL. 2014. Historical review and surimi technology and market developments. In Surimi and Surimi Seafood, Third edition. (Ed.) Park JW. Chapter 1. CRC Press: Boca Raton, FL. 33. Park JW, Graves D, Draves R, Yongsawatdigul J. 2014. Manufacture of surimi: harvest to frozen block. In Surimi and Surimi Seafood, Third edition. (Ed.) Park JW. Chapter 3. CRC Press: Boca Raton, FL. 34. Kristinsson HG, Lanier TC, Halldorsdottir SM, Geirsdottir M, Park JW. 2014. Fish protein isolate by pH shift. In Surimi and Surimi Seafood, Third edition. (Ed.) Park JW. Chapter 6. CRC Press: Boca Raton, FL. 35. Poowakanjana S, Park JW. 2014. Comminution process of surimi and surimi seafood paste. In Surimi and Surimi Seafood, Third edition. (Ed.) Park JW. Chapter 8. CRC Press: Boca Raton, FL. 36. Park JW, Beliveau JL. 2014. Manufacture of crabstick. In Surimi and Surimi Seafood, Third edition. (Ed.) Park JW. Chapter 9. CRC Press: Boca Raton, FL. 37. Kok N, Thawornchinsombut S, Park JW. 2013. Manufacture of fish ball. In Surimi and Surimi Seafood, Third edition. (Ed.) Park JW. Chapter 11. CRC Press: Boca Raton, FL. 38. Park JW, Yoon WB, Kim BY. 2014. Surimi paste preparation, gel analysis, and rheology. In Surimi and Surimi Seafood, Third edition. (Ed.) Park JW. Chapter 17. CRC Press: Boca Raton, FL. 39. Park JW, Ooizumi T, Hunt AL. 2014. Ingredient technology for surimi and surimi seafood. In Surimi and Surimi Seafood, Third edition. (Ed.) Park JW. Chapter 18. CRC Press: Boca Raton, FL. 40. Park JW, Yongsawatdigul J, Kim DS, and Tungkawachara, S. 2014. Chapter 13 - Fermented fishery products. In The Oxford Handbook of Food Fermentations. ed., C Bamforth and R Ward. New York, NY, USA: Oxford University Press, Inc.